The following report was published by the Embassy of the Bolivarian Republic of Venenzuela in the United States. Members of the ANSWER Coalition attended the event to honor the late President and affirm our ongoing solidarity with the Bolivarian Revolution. As part of the commemoration on Sunday, July 28, of the 59th anniversary of the birth of the leader of Venezuela’s Bolivarian Revolution, Hugo Chávez Frías, the Embassy of the Bolivarian Republic of Venezuela in the United States held a mass at the Our Lady of the Americas Parish and a photo exhibit at the Bolivarian Hall, the Embassy’s cultural space in Washington, DC. Both activities were attended by authorities, members of the diplomatic corps, and admirers of the ideals and actions of the late President in favor of social justice. 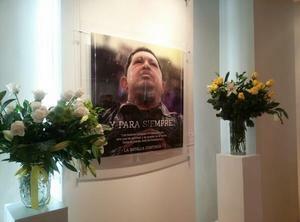 The photo exhibit, entitled “Chávez: Sowing the nation, reaping revolution” (“Chávez, siembra de patria, cosecha de revolución”), which is on display until December, was launched in the afternoon by Soraya Bracho de Ortega, the wife of the chargé d’affaires of the Venezuelan Embassy, Calixto Ortega, who was attending commemorative events in Caracas. Mr. Ortega did however address the event by telephone, thanking those who attended for coming to the exhibit and remembering the legacy of President Chávez. The exhibit recalled Chávez as a man, a communicator, a father, and also the father of a nation who promoted the struggle for regional integration and the reassertion of sovereignty over the country’s oil reserves. Also that afternoon, a mass honoring the late Venezuelan leader was held at Our Lady of the Americas Parish and attended by officials including Venezuelan Ambassador to the Organization of American States Roy Chaderton Matos, who thanked Father Evelio Menjivar for officiating. “The priest did a very moving job and also demonstrated that he understood the continental and global dimension of the work of President Chávez, what he did for Venezuelans, what he did for Latin Americans, what he did for the poor people of the world… And today we are remembering him with the pain of his departure but with happiness for his life,” Ambassador Chatterton said. Meanwhile, the consulates of the Bolivarian Republic of Venezuela around the United States held various activities to celebrate the 59th anniversary of Chávez’s birth. In New York, a selection of photos and posters of Chávez was displayed as well as a set of paintings of Venezuela’s 19th century independence leaders, and a concert of traditional llanera music was offered along with courses on Venezuelan cuisine and the instrument known as the cuatro. Click here to watch a video about the commemorative events in Washington. Click here to see photos. Reprinted from the website of the Embassy of the Bolivarian Republic of Venezuela in the United States. Click here to read the original posting.